Linear drains 1000 mm is one of the longest wet room drainage available in our store. It's one of the most popular wet room drain size. Equipped with necessary parts to fit our linear shower drains are also easy to clean and can be fitted almost anywhere in the shower: in the middle of the floor, against the wall or at the entrance. They are available in 8 lengths, from 500 to 1200 mm, allowing to turn both small and big spaces into fancy, super-stylish and perfect for creating a contemporary look. 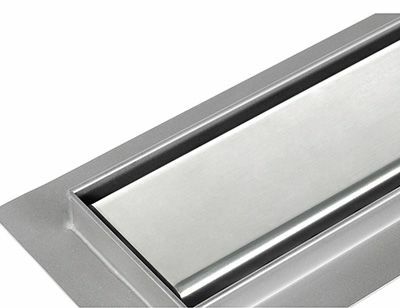 Premium drain channel is 84 mm wide, while it comes with included Ponente plain stainless steel pattern without any holes, solid bar of brushed steel which is 64 mm wide, grate is 994 mm long and total drain length with insulation flange is 1060mm. Sealing membrane is a blue non-woven fabric which bonds well in the glue and is resistant to cracking. Premium drain channel is 84 mm wide, while it comes with included Mistral grating, which features a pattern of regularly placed circles of various size along the entire part length, 64 mm width, grate is 994 mm long and total drain length with insulation flange is 1060mm. Sealing membrane is a blue non-woven fabric which bonds well in the glue and is resistant to cracking. Premium drain channel is 84 mm wide, while it comes with included Tivano suitable cover, with pattern of regurarly placed L-shaped rectangles with a square inside from beginning to end of the grate, it is 64 mm wide, grate is 994 mm long and total drain length with insulation flange is 1060mm. Sealing membrane is a blue non-woven fabric which bonds well in the glue and is resistant to cracking. Premium drain channel is 84 mm wide, while it comes with included Sirocco which is considered to be the most practical pattern, with 3 rows of square shaped holes running parallelly to cover edge and 64 mm wide, grate is 994 mm long and total drain length with insulation flange is 1060mm. Sealing membrane is a blue non-woven fabric which bonds well in the glue and is resistant to cracking. Width of Classic drainage channel is 8 cm and it has included Pure tile able grate, which is 12 mm deep and 64 mm wide, grate is 994 mm long. During installation, you need to create support below the entire channel and you can set the height it protrudes above the floor surface. It allows you to adjust the lip height to match your tiles thickness. To ensure the drain works properly, surrounding area should be sound and tanked. Width of Classic drainage channel is 8 cm and it has included Zonda grate hole pattern, which is a row of rectangles set diagonally across the entire cover length, it is 64 mm wide, grate is 994 mm long. During installation, you need to create support below the entire channel and you can set the height it protrudes above the floor surface. It allows you to adjust the lip height to match your tiles thickness. To ensure the drain works properly, surrounding area should be sound and tanked. Width of Classic drainage channel is 8 cm and it has included Mistral grating, which features a pattern of regularly placed circles of various size along the entire part length, 64 mm width, grate is 994 mm long. During installation, you need to create support below the entire channel and you can set the height it protrudes above the floor surface. It allows you to adjust the lip height to match your tiles thickness. To ensure the drain works properly, surrounding area should be sound and tanked. Width of Classic drainage channel is 8 cm and it has included Tivano suitable cover, with pattern of regurarly placed L-shaped rectangles with a square inside from beginning to end of the grate, it is 64 mm wide, grate is 994 mm long. During installation, you need to create support below the entire channel and you can set the height it protrudes above the floor surface. It allows you to adjust the lip height to match your tiles thickness. To ensure the drain works properly, surrounding area should be sound and tanked. Chat started. Session ID: 1556252012. You are now connected to: David M.